Note: This report included a holiday weekend. Since vacation travel is holding up better than business travel I'd expect year-over-year RevPAR (and occupancy rate) to be off less than earlier this year for the summer months and especially for holiday weekends. In year-over-year measurements, the industry’s occupancy fell 6.0 percent to end the week at 57.7 percent. Average daily rate dropped 7.4 percent to finish the week at US$95.16. Revenue per available room for the week decreased 13.0 percent to finish at US$54.94. 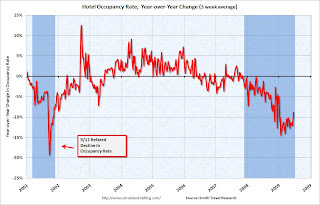 This graph shows the YoY change in the occupancy rate (3 week trailing average). The three week average is off 8.8% from the same period in 2008. The average daily rate is down 7.4%, and RevPAR is off 13.0% from the same week last year. Note: the occupancy rate will rebound in the next report - this is the normal pattern. The hotel occupancy rate is usually the highest during the peak vacation months of June, July and August and declines on weeks with holiday weekends.